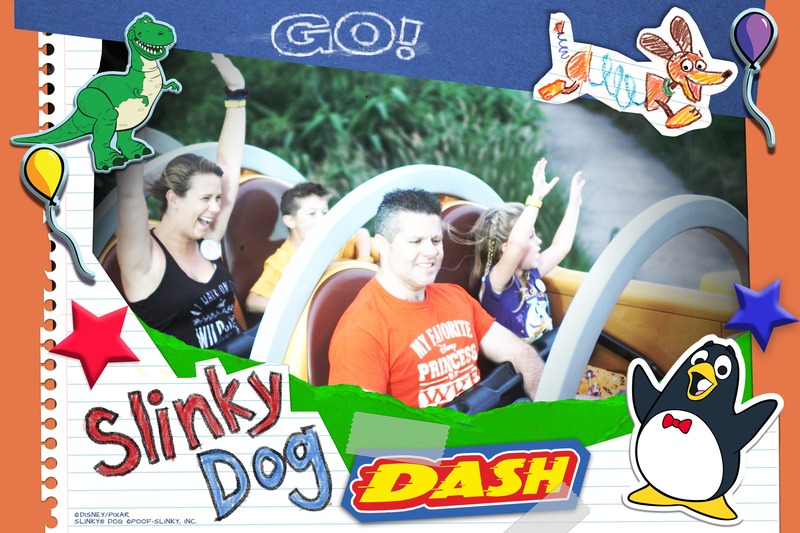 Finally, it was our day to ride Slinky Dog Dash!!! There was a ton of excitement among the four of us. It was highly anticipated and since we missed the rope drop advantage when we arrived late to Hollywood Studios at the beginning of the trip we had to wait to use the FastPass on this day! 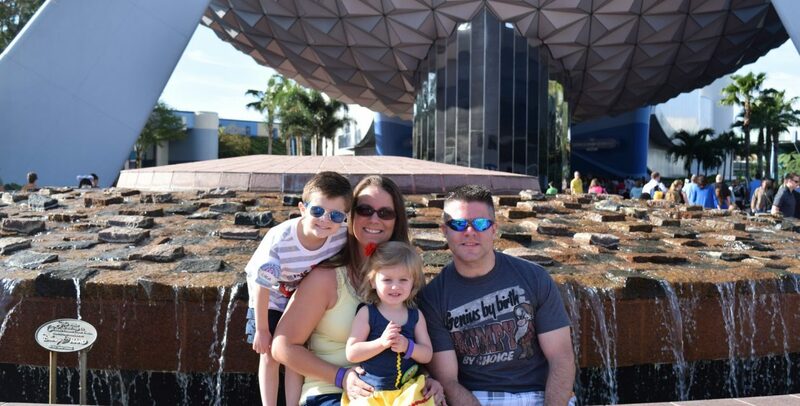 Our morning had been relaxing with breakfast, chilling in our room, and snacking around the world in Epcot. Now we were hopping over to Hollywood Studios for more Toy Story Land and dinner at one of our favorites: Hollywood & Vine. We boarded the Friendship Boat just as our FastPass+ window started for Slinky. About 25 minutes later we had made our way through security and to the cutest height requirement checkpoint throughout the parks. Everyone was very clearly over the requirement but I still needed a picture of this little Candyland piece! And then we saw Slinky! The ride has had great reviews and it did NOT disappoint at all. The relaunch in the middle of it is amazing! After riding we all agreed that we would wait up to an hour for it. Peanut said he’d wait all day, but we know the kids don’t have that kind of patience even in a cute queue line. Next, we’ll make sure the kids sit on the inside for a better ride photo and hopefully, Disney fixes the light settings. Our dinner reservation was wisely set for immediately after the ride. I try not to schedule rollercoaster or potentially jerky rides after meals to be on the safe side. I don’t think we would have had a problem with slinky because the ride was really smooth. Our night was scheduled to be rather laid back. We milled around Echo Lake after eating and took some pictures. Grumpy even had a little fun and wore Diva’s Maleficent ears for a minute. After our silly shenanigans around the lake, we wandered through a few stores and then split up so Diva could see the Frozen Sing-A-Long and Peanut could ride Alien Swirling Saucers. Grumpy wanted to pass on the swirling around so back to Toy Story Land I went. Grumpy did not take any pictures in the show, but he tells me he may have sung along for a minute. We met at Tower of Terror and realized we had a misunderstanding about the stroller. Grumpy decided he would go retrieve it and skip the drops on the Tower of Terror. Peanut was nervously agreeing to give it a second try after saying he never wanted to ride again earlier in the week. Diva, on the other hand, was literally jumping up and down to ride! We were all laughing when we got off the ride, especially at the picture where I looked like I was causally fixing my hair. The evening was going to close out with Fantasmic. We grabbed a few quick snacks before heading into the theatre. It was our first time back at Fantasmic since our first visit in 2016. Diva missed the show that year because she fell asleep before it even started. In her defense, she was only 2.5 and we had been at the park since it opened. I spent most of my time enjoying the show and didn’t capture the projections this time, but I did take a few photos of the excitement at the end. Immediately following the show we followed the mass exodus out of the park while the fireworks were starting. We intended to walk back to the resort thinking that the boat and the bus (if running) would have long lines. Grumpy looked to the boat dock as it came into view and said the boat was approaching and there was almost no line so we took the easy way back. As the boat sailed back towards the resorts we were able to watch the fireworks from our seats! Grumpy was moving out of the way so people could exit at the Swan and Dolphin stop and we decided to jump off too knowing that it was quicker to walk back to our resort than to make the extra stop at the Boardwalk. It was an awesome decision. While we were walking over the bridge we caught a glimpse of Spaceship Earth and stopped to wait just a couple minutes so we could watch our SECOND fireworks display of the evening, Illuminations. It was such a fun way to end another day and really solidified how I loved staying in the Epcot resorts area so much more than I imagined I would. Next Post: Celebrating One Year of nikkismickeytrips!